Most of the world is religious, and millions more are openly superstitious, spiritual, or credulous of the paranormal. But I argue that we all believe in magic—luck, mind over matter, destiny, jinxes, life after death, evil, and heavenly helpers—even when we say we don’t. 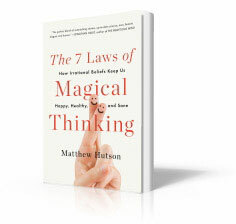 I draw on cognitive science, neuroscience, social and evolutionary psychology, and cultural observation to show that we engage in magical thinking all the time—and that it’s not all bad. Supernaturalism leads us to think that we actually have free will. It makes us believe that we have an underlying purpose in the world. It can even protect us from the paralyzing awareness of our own mortality. Irrationality makes our lives make sense. I explain how cognitive errors can reveal our deepest longings and wisdom, and—added bonus!—I share my own rocky quest toward a more meaningful life. Here is the book’s Introduction as a PDF.